Wasp has released version 1.2 of the mobile Package Tracker application, which must be manually updated on the mobile device before you can download the full data set. Before updating, you will still be able to work with the data that is already downloaded, so you should not lose info. When you do Tools, Download data, you receive this screen. The Retry button produces the same message, and the Close button closes the app. On a PC, browse to the Package Tracker website https://tracker.waspbarcode.com and log in. Click into Admin > Mobility Center > Upgrade section. Download the linked PackageTrackerMobile.CAB from that page to your PC, by right-clicking it, then Save Target As, Save File As, or similar command. Connect the mobile device to the PC with a cable or cradle connection. On the PC, use Windows Mobile Device Center's File Management > Browse the contents of your device, to go into \ folder, then My Documents. Copy the downloaded file there. On the mobile device, open Start, File Explorer. This should open up in My Documents. 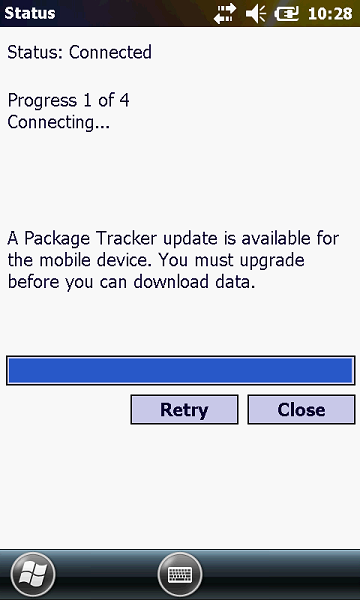 Find and run PackageTrackerMobile.CAB, clicking OK or Install at the prompts, whichever option you have, until the file is installed. After this update, future releases will be automated, eliminating this manual update process.